Ultimate Blog Party 2011! We're Partying Once Again! Hold the phone, did someone say party? Ultimate Blog Party? Oh, we're so there. We've been excited for this big ol' bloggy bash to roll around since... well, since last year. The excitement over it finally being time is pretty hard to contain and we're quite literally jumping for joy that it is time once again. But I have had a special request this year to ask you if you've brought cake. Because we loved all of our visitors in 2010 and the chance to get to know you all... but, really, we needed some cake. Cake makes every party better, doesn't it? If you aren't here for the Ultimate Blog Party and just happen to be reading this post wondering if I've lost my mind, please rest assured that I haven't (at least not completely). 5 Minutes for Mom throws an annual bash that takes the vast hugeness of the blogosphere and somehow makes it seem... personal. 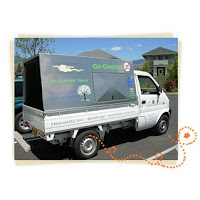 If you are here for the Ultimate Blog Party, welcome to Thanks, Mail Carrier! Those crazy girls up there and I are glad that you stopped by and we hope that you're having a great time at this unique event. If you feel like entering a giveaway or two or two dozen while you're here, please feel free! We do like to give stuff away around here, there's something so satisfying about telling someone that they're a winner. Who doesn't like to hear that? But even if you don't enter, please do leave a comment! We're actually on vacation right now and I will be slowly but surely making my way around to every single visitor's party as soon as I can and I want to know that you stopped by! Also, if you follow or subscribe, let me know so that I can return the favor! What's up with calling your blog Thanks, Mail Carrier? What can I say? We love the mail! My daughters might have a slightly skewed view as to what is "normal" for a mail carrier to deliver on any given day, but that's okay. As soon as we hear the vrooom of a vehicle coming down our block, you can find the girls and I peering out the window to try to catch a first glimpse at what the USPS, UPS, or FedEx truck might be bringing. Tell me more about your kids. Well, certainly. I don't think you have to ask too many moms more than once to do that. My 4-year-old, Big Sister E, is caring, creative, inventive, beautiful, stubborn, and acts completely shy when meeting new people (she won't even make eye contact) even though she talks nonstop when we're at home. She loves books, games, arts & crafts, being adored by her sister, preschool, swim lessons, and trying to charm her mother into giving her sweets "because I was good. Right? I was good? I have something special now, Mama? Huh? Can I?" Then there's my 2-year-old, Little Sister B. She's a crazy one, that girl. She is sweet, happy, independent, loud, bull-headed, and my funny little comedienne. She likes giving her sister big hugs, pretending with play food, singing Row, Row, Row Your Boat, and jumping. Lots of jumping. Together, the three of us (and Daddy too, every now and again) have been reviewing products and sites from all across the spectrum since 2009. From apparel to jewelry to food to household items to music to shoes to toys to gear to technology... to everything in between - we've worked hard but have also enjoyed doing it more than I ever would have guessed. Blogging has opened my eyes to an entire world that I didn't know existed and has brought me opportunities that I never would have thought possible when I first started writing. I've been flown across the country more than once, attended amazing events, actually succeeded at a weight loss program, and opened my door to find pretty incredible products on the other side. Do I consider myself lucky? Absolutely. However, none of it compares to the people I've met and the friendships that I've made through blogging. This community may be bigger than I can imagine and growing by the day, but I am so grateful and glad to be a part of it with all of you. I just hope that the friends that I talk to that help keep me going know just how important they are. Thanks so much for stopping by! Don't be a stranger, come back and visit anytime, we're always happy to have people stop over. Now, go enjoy the rest of the party! We'd really like to give you a big hug before you go, but since that's not possible, we'll just have to stick with the little lovefest that we're having here instead. Now, really. When is someone going to pass the cake? 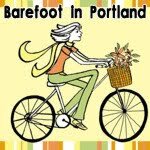 "More than a blog... a busy mom's sanctuary" sums up what you'll find Karen writing about at Barefoot in Portland. This busy mom of a beautiful 5-year-old daughter keeps up with her day job, her family, delicious recipes, and reviews and giveaways that everyone can enjoy. Stop by and see what this blog hopping, vacation-taking mom is up to next! 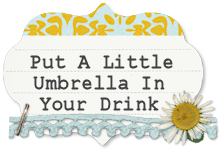 With the cutest header that is going to make you long for the beach, Lesli at Put A Little Umbrella In Your Drink has the perfect mix of fun. Her posts will keep you up to date on deals, freebies, rebates, rewards, great giveaways going on throughout the blogosphere that you're not going to want to miss, and her love of photography. All that's missing is a pina colada! Wouldn't it be nice if, when arriving at a website, there was a little meter that could answer the questions that you're really thinking? Is this furniture going to fall apart after one month? Are these sheets going to turn out to be scratchy and rough? Are these toys truly safe for my children? Is that gadget going to be out of date by the time it arrives here? I just want to know that a company cares - about their products, about the environment, about their customers. I want to know that they love what they do and are passionate about sharing that with the world. On top of that, I want their products to be well-made, high quality, and ones that I'm going to look at every day and be happy that they're in my home. Is that all too much to ask? For a lot of sites, yes. But for Yala Designs, that's exactly what you'll find in their stylish, comfortable, and gorgeous bamboo apparel, bedding, and accessories. Already having introduced the world to their amazing DreamSacks, Yala Designs has taken their knowledge and turned it towards eco-friendly clothing for the entire family. Made from organically formed bamboo that is stain, wrinkle, and odor-resistant, your wardrobe will never be the same once you've tried these items on. Plus, if their amazing products aren't enough, Yala is one business that you can be proud to support. This family-owned company takes fair trade to a higher level and keeps in touch with their factories and bamboo groves around the world as often as possible. They also support over a dozen local and global organizations that care for communities all across the world. But that's not all. Yala is also completely green, doing everything possible when it comes to reusing, recycling, utilizing solar energy... they even ship responsibly (they drive an electric truck!) and make all inbound or outbound shipments carbon neutral. How many companies do you know that can claim that? So even though I was already impressed with Yala and completely smitten with the look of the Bamboo Dreams Circle Top and the Bamboo Dreams Women's Natural Wide Leg Pants just from their pictures, seeing and feeling them in person was a whole different story. Crafted from sustainable fibers using 100% Azo-free dyes, these items felt so incredibly silky and soft that it is hard to believe that they don't contain actual silk. 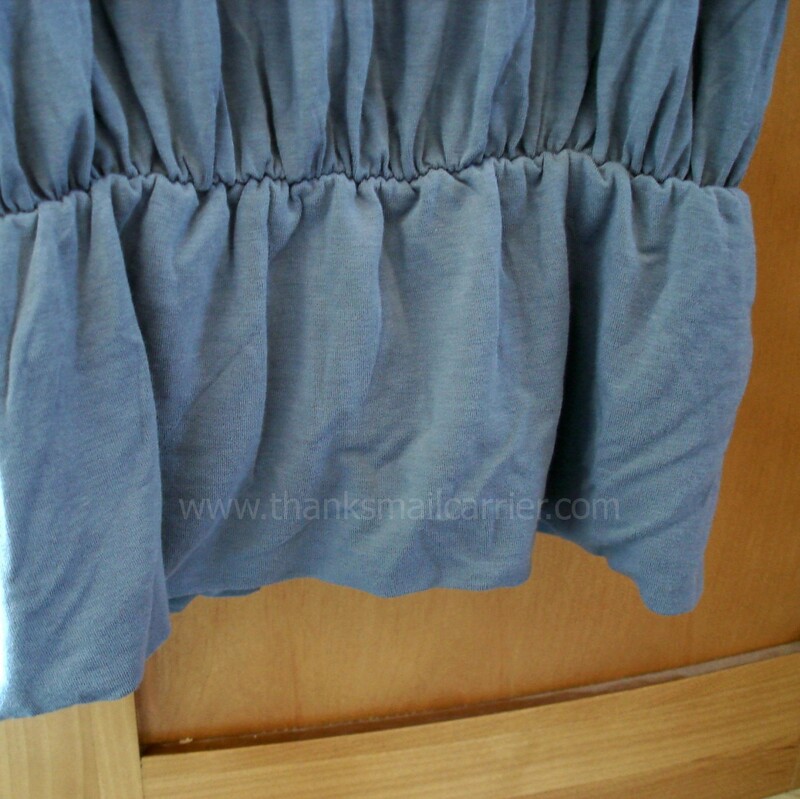 As I unfolded each piece, the wrinkles seemed to melt away and all that was left was a comfortable, relaxed style that was ready for multiple occasions. Slipping first into the Natural Wide Leg Pants, I was immediately in love with the flowing, chic look and the incredible smooth feel that they provided. Somehow combining the comfort of your worn-in sweatpants with the style of a fashion show, these are quite likely my favorite pair of pants. Ever. They fit, they flatter, they go with absolutely any top, and have I mentioned how darn soft they are? I want to put them on every morning and sleep in them every night, they just feel so good. And when I pair the Natural Wide Leg Pants with Yala's Circle Top, it's like they were just made for each other. 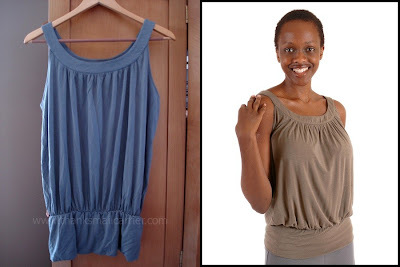 Even though it appears blue in the picture, this top is a smokey gray that I love and that only complements the flowy bodice. When my husband first saw me wearing the Circle Top, he pointed out right away how "that's the type of top that ALL women should wear. Look how it flows and would flatter everyone!" After I got done laughing, I had to admit that of course I agreed. Yala came up with just the right combination of trendy and timelessness for this simple design. From the gathers at the neckline to the band at the bottom, this top goes well with skirts, jeans, loose pants and more and can easily be dressed up or down for the occasion. I couldn't be happier with Yala Designs as a company and with their amazing apparel. They clearly care about the environment as well as with providing their customers high quality items that are safe from any unwanted, harmful ingredients... and that will surely provide style, comfort, and luxury for any age or for your home. The first two things that I packed in my suitcase for vacation recently were these! from Yala! ARV $29 and available in 10 colors! To enter to win: Visit Yala Designs and tell me which beautiful item (other than those mentioned in this post) is your favorite. 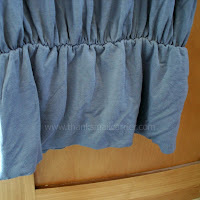 1 Extra Entry (per method) if you follow Yala Designs on Twitter and/or Like them on Facebook. Giveaway will end on April 21st at 11:59pm CST. Do me the favor of leaving an email address or making absolutely sure it is visible in your profile, I have to have a way to contact the winner. The winner will be chosen by random.org and announced here as well as emailed and will have 48 hours to contact me or respond to notification or a new winner will be chosen. This giveaway is open to residents of the U.S. and Canada only (Canadian residents will be responsible for any fees incurred). 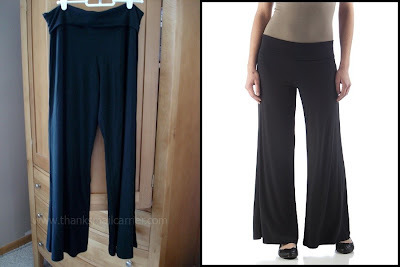 A big thank you to Yala Designs for providing a Bamboo Dreams Women's Natural Wide Leg Pants and Bamboo Dreams Circle Top for me to review as well a Lightweight PashBu Scarf for one lucky giveaway winner. The opinions shared are my own and honest and if you really need to see more, click here to see how I roll. There are a select few products where I am loyal to a particular name brand. Maybe it's a food that just tastes better or a shampoo that leaves my hair with that something extra, but I'm willing to pay a little bit more to know that I'm getting exactly what I'm looking for. But overall, buying the store brand is exactly the same with only one difference: price. And not just a few pennies, but major savings that can really add up. Everything from things like diapers to beauty supplies can keep money in your pocket while providing your family with the same exceptional results that you would expect from the big brand names. Which is why turning to Walgreens Brand Health & Wellness Products will not only result in a great value, but it will allow families and individuals to save money without sacrificing quality or trust. With the rising cost of health care, saving money on over-the-counter medications can really benefit a family’s budget. I have purchased a variety of Walgreens Brand Health & Wellness Products over the years and have always found that they have done an excellent job... which, if for some reason they didn't, I would have taken advantage of the fact that they have a 100% satisfaction guarantee. So, knowing that Walgreens Brand Health & Wellness Products are Walgreens pharmacist recommended and that most contain the same active ingredients as other national brands, I was interested in trying out a new one for us: Walgreens Brand Triple Antibiotic Ointment. 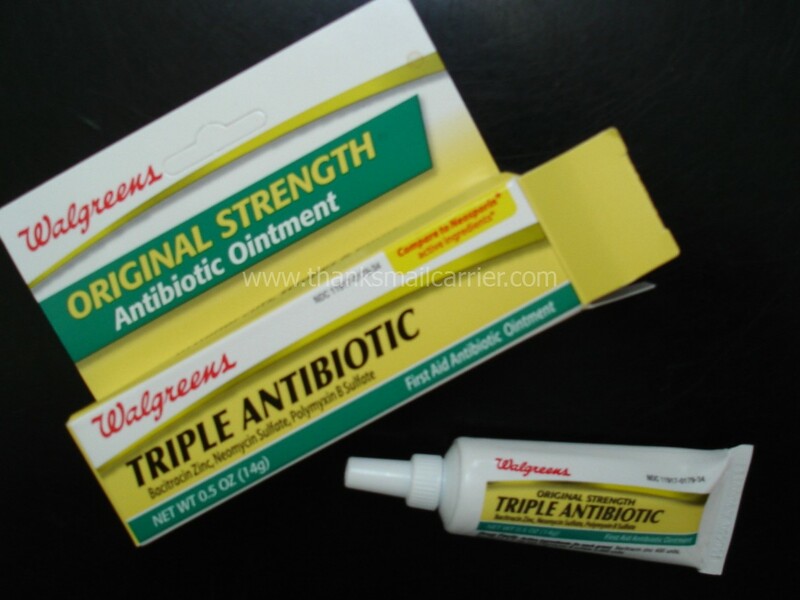 We have long used Neosporin to help heal cuts and wounds faster (Big Sister E calls it the "magic cream") so replacing it with this Antibiotic Ointment was an easy transition. Considering the number of scrapes and cuts that my kids receive, I'm a big fan of anything that helps protect them from further irritation and infection by bacteria in the environment. We simply applied the Antibiotic Ointment before covering a wound with a bandage and let it do its job - quickly, easily, and pain-free. In addition to being an exceptional value for you (it retails around $3.79 where the name brand is around $6.19), purchasing Walgreens Brand Health & Wellness Products benefits your community as well through the Walgreens Way to Well Fund™. Every year Walgreens contributes up to $3 million to this fund, which provides free preventative health tests as well as other health and wellness services and education to local communities. To learn more about Walgreens Brand Health & Wellness Products, visit their website or talk directly with the pharmacist at your neighborhood Walgreens or right online. What about you? Are you loyal to brand names or do you think that the store brand works just as well? At some point I turned around and the first three months of 2011 were gone. On the one hand, it makes me wonder where the time went and wistfully think of all (if any) of the things that we accomplished so far this year. But, on the other hand, it also means that spring is finally drawing near and, along with it, Easter. Every family has their own Easter traditions and things that they do to celebrate, but personally, the holiday isn't complete if my kids haven't scavenged for eggs and candy and I don't send Easter chocolate. It just wouldn't be the same without fun and yummy gifts! And this year there is no better place to look than the experts at Happy Easter Store, where you'll find everything from baskets to bunnies to bring a smile to your family and friends. Whether you know exactly what you're looking for or are searching for some inspiration for what to purchase for those on your list, Happy Easter Store has hundreds of fun and fresh ideas waiting for you. From classic springtime presents to mouth-watering treats of all kinds to unique and personalized Easter gifts, there's something for every age and interest. And when it comes to what we're interested in around here, all eyes turn towards anything chocolate. So when the Rocky Mountain Chocolate Collection arrived, there was no doubt that it was going to be a hit. 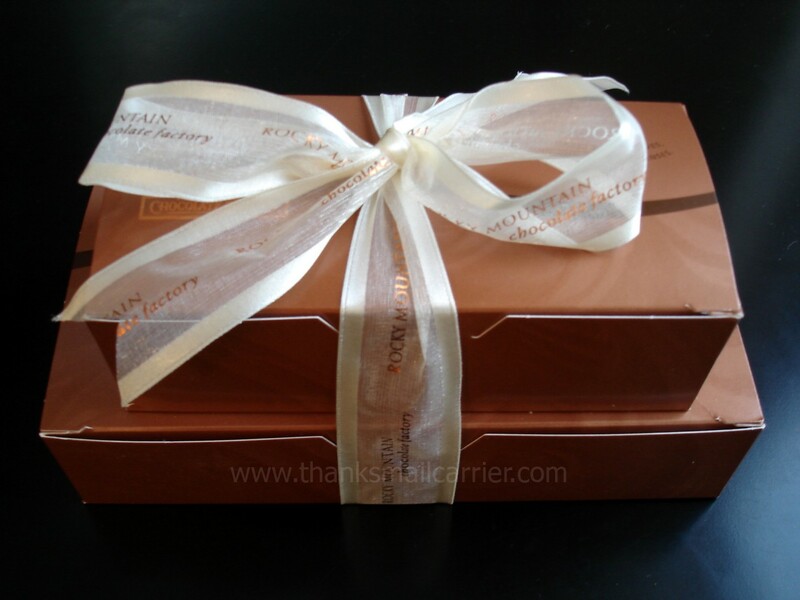 The description of this amazing gift had told me that the Rocky Mountain Chocolate Collection contained two pounds of certified Kosher dairy chocolate in the form of 36 assorted chocolates, 12 pieces of English toffee, and 12 pieces of milk chocolate pecan and caramel clusters... but I was still somehow unprepared for just how much chocolate that would be. 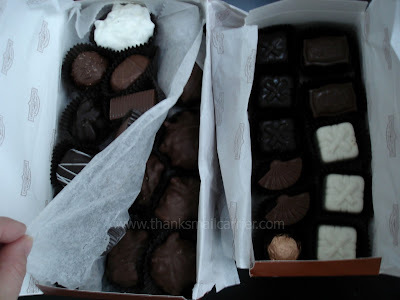 But then I realized there were actually layers of chocolates in both boxes, which meant that even after all of the delicious treats on top where gone, there were plenty more still remaining. 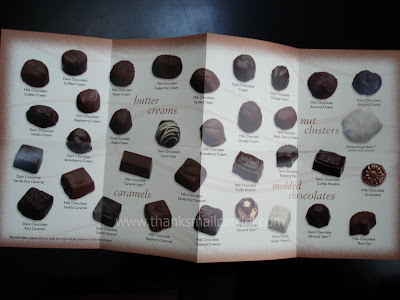 With two layers in the smaller box and three layers in the larger box, I would have been much more overwhelmed had Happy Easter Store not included a great fold-out guide to help me keep the creams separate from the caramels and the milk from the dark chocolates. 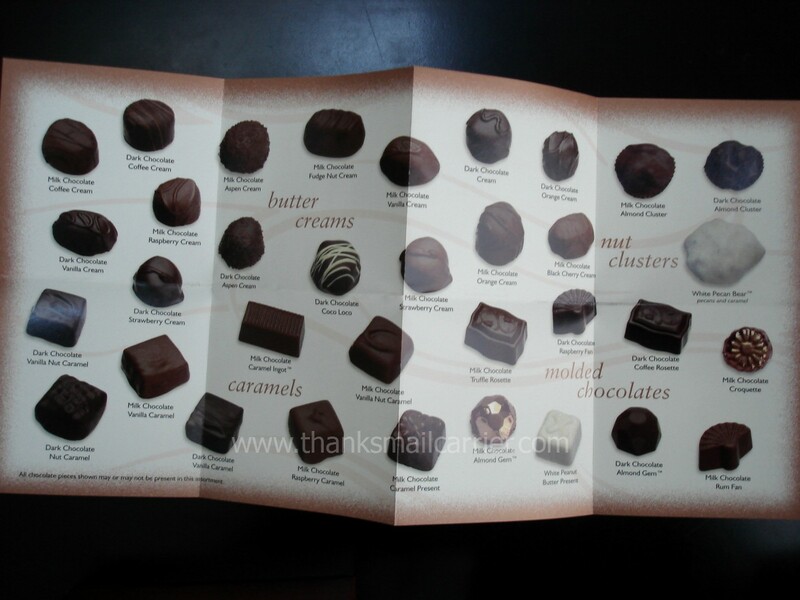 I always love when chocolates come with this helpful addition! 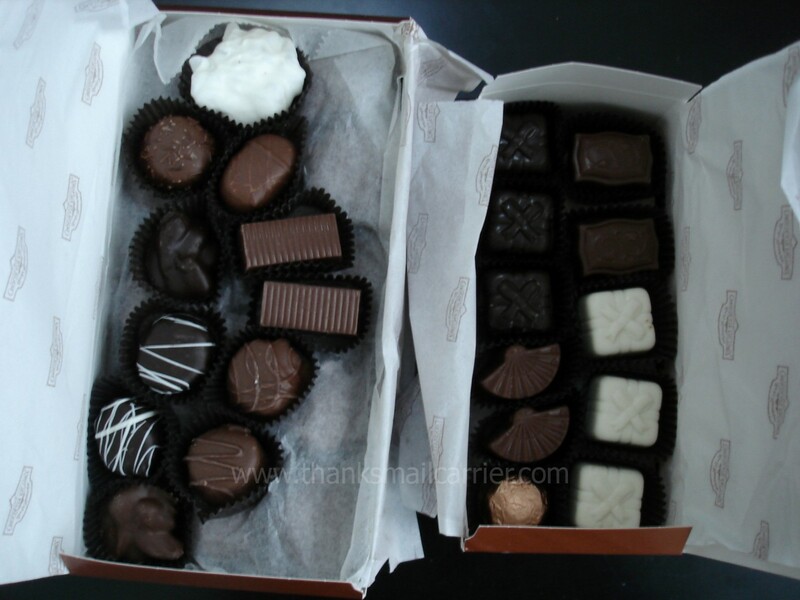 There isn't any question that these chocolates were completely delicious. We sampled some here and then my husband took the rest with him to work (so as I wouldn't devour them in one day) and said that there were many, many compliments from his coworkers about how much they enjoyed this pre-Easter treat. Retailing for $49.99, the Rocky Mountain Chocolate Collection was a big winner with all of its gourmet chocolate and rich, luscious flavors. But if chocolates aren't your thing (what? Are you feeling okay?) Happy Easter Store has plenty of other categories to choose from. From cute stuffed bunnies to beautiful flower arrangements to decor for your home to Easter baskets and gifts of all kinds, you'll find it all in one place and able to be ordered quickly and easily. With such high quality and large variety available in one place, you're sure to appreciate the affordable prices and convenience that Happy Easter Store can provide for you this year. 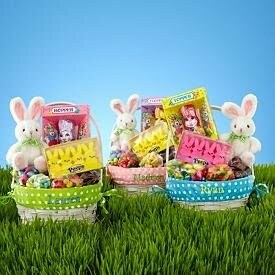 One lucky person will win a $50 gift card to Happy Easter Store! To enter to win: Visit Happy Easter Store and tell me what you might purchase with this gift card if you win. 1 Extra Entry (per method) if you Like Happy Easter Store on Facebook. A big thank you to Happy Easter Store for providing a Rocky Mountain Chocolate Collection for me to review as well as a $50 gift card for one lucky giveaway winner. The opinions shared are my own and honest and if you really need to see more, click here to see how I roll. 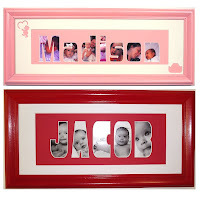 When it comes to decorating, there are two things that I always love to include: photographs and personalization. There's just nothing better than incorporating pictures of my girls throughout the house and no matter if they are from infancy or recent, each image always makes me smile. As for the personalization aspect, that may come from having a unique name myself. But even if I didn't, who doesn't love knowing that a gift was created just for them? There's just something extra special about having your name incorporated right into a design that children and adults can always appreciate. So what is the perfect combination? An innovative and attractive keepsake from NameFrame.com. 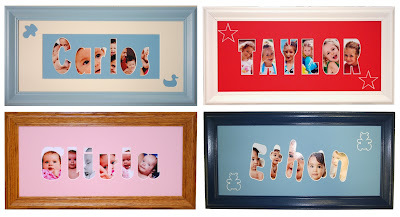 With more than 50 years of experience in helping people around the United States celebrate births, holidays, and special occasions through the creation of customized keepsakes, purchasing a NameFrame gives you the opportunity to give a timeless, personalized gift that you create yourself. What child wouldn't be excited to unwrap their present and find their favorite photographs beautifully displayed through cutouts of their own name? 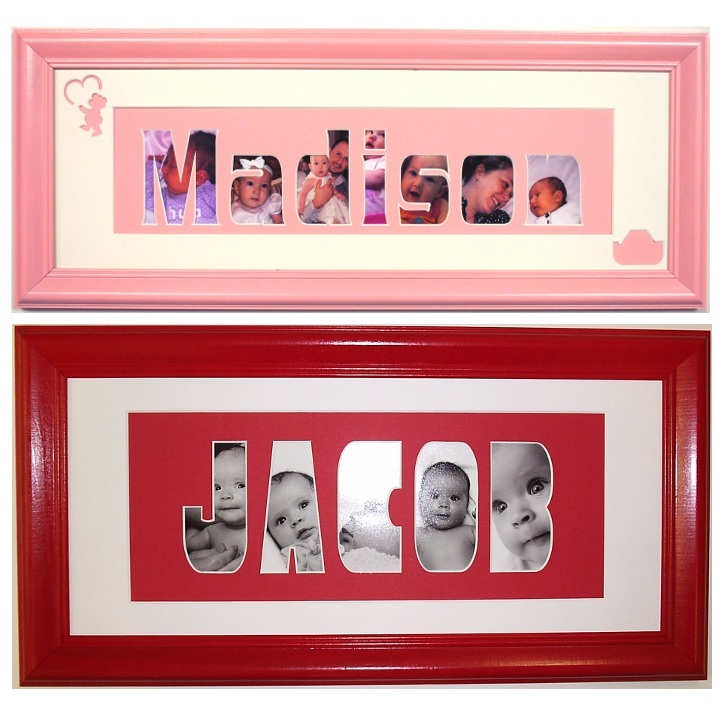 Or what expectant mother wouldn't love to receive a personalized baby frame at her shower that she will be able to display for years to come? 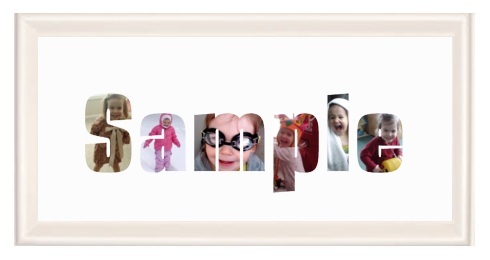 When it came time to design my own NameFrame, I found that the process couldn't have been easier. 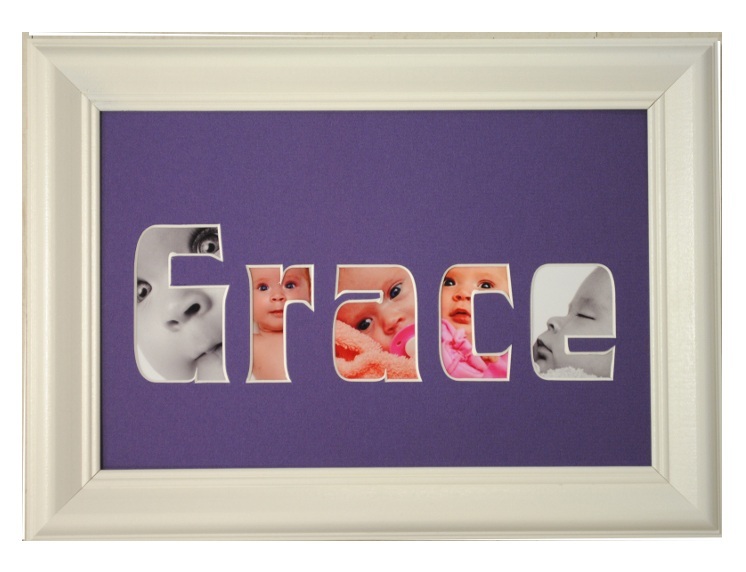 By simply entering in the name that you would like displayed, you are then able to choose the font, frame color, matting style and color, additional cutout decorations and more, all with previews along the way so that you can see exactly what your final product will look like. I really enjoyed changing Little Sister B's name from font to font to see which one I liked best and then trying out various color combinations of the mats and the frames. There are even a ton of cute ornament cutouts to include such as hearts, balloons, crayons, animals, and more. 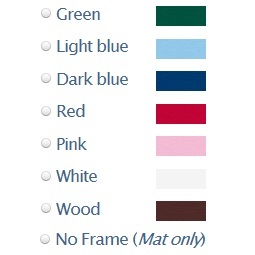 My only disappointment came when I realized that although there are seven frame colors to choose from (or the option of not having a frame at all), black wasn't available. Considering that we have mainly black frames in our house, I would have really liked to be able to select that so that our NameFrame would have matched the rest of our decor a little more. However, white was a great second choice and I moved on to deciding whether or not I wanted to upload my photos into the NameFrame or to add them in after it arrived. What a great feature! 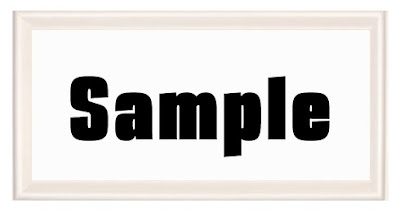 Although it would be easy to open up the frame and slip in pictures, I really appreciated that NameFrame allowed me to pull my photos right off of my computer to upload and size them to include in with my order. Except, of course, with her actual name instead of Sample. After submitting my order, all that was left to do was to sit back and wait for the finished product to arrive... which was only a few days later! When the NameFrame arrived, I was pleased to see it securely packaged in bubble wrap to ensure there wasn't any damage... and the finished product is gorgeous! Prior to the frame's arrival, my husband had been hinting that he thought it might not be all that attractive (he's kind of cynical that way), but after seeing it, even he has commented on the high quality and how great it turned out. The cutouts of each letter are sharp and precise and the photos are exactly as I had positioned them. Now the hardest part is deciding where to hang Little Sister B's NameFrame up! She loves looking at the pictures of herself and pointing to each letter, so this will most likely find a home in her room - where the white will pop even more against her colored walls. 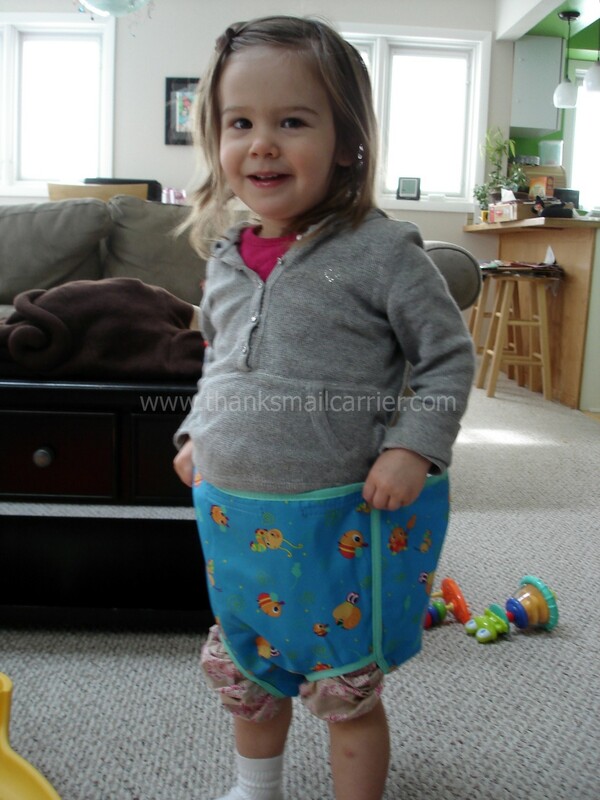 Now we just have to order one for Big Sister E! For a unique and great personalized gift idea, NameFrame provides a one-of-a-kind, durable idea that everyone is sure to love. The whole process of creating it was quick, simple, and very convenient and the result is exactly as you choose it to be. The 10⅝" x 20⅝" size creates a stunning visual impact but is easily small enough that it can be placed in a variety of locations. One lucky person will win a NameFrame of their own! 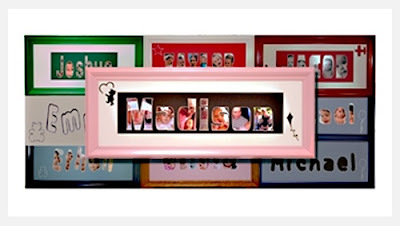 To enter to win: Visit NameFrame.com and tell me something that you learned there or which style of their unique frames/mats/ornaments is your favorite. 1 Extra Entry (per method) if you follow NameFrame on Twitter and/or Like them on Facebook. Giveaway will end on April 19th at 11:59pm CST. Do me the favor of leaving an email address or making absolutely sure it is visible in your profile, I have to have a way to contact the winner. The winner will be chosen by random.org and announced here as well as emailed and will have 48 hours to contact me or respond to notification or a new winner will be chosen. This giveaway is open to residents of the U.S. and Canada only. A big thank you to NameFrame for providing a NameFrame for me to review as well as for one lucky giveaway winner. I received one or more of the products mentioned above for free using Tomoson.com. The opinions shared are my own and honest and if you really need to see more, click here to see how I roll. I wouldn't let my husband put a single one away because, well, they each did different things. What if today was the day that Little Sister B wanted to sit and relax? Or maybe be active and jump? Or I just needed a place for her to hang out and be entertained while I washed dishes or grabbed a quick bite to eat? For today's little ones, there is a new answer. I would have gladly traded in a pile of not-so-thrilling baby gear for just one that was entertaining, fun, safe, and convenient... all of which is found in the Bounce-a-Bout from Bright Starts. Known for putting fun first, Bright Starts offers smart, fresh solutions for parents and their baby that deliver convenience, value and fun throughout each day. With everything from high chairs to swings to toys, you can easily find the product for at home or on-the-go that will work for the little one in your life. And when it comes to entertainers, Bright Starts is no stranger to knowing what babies like and what parents want. 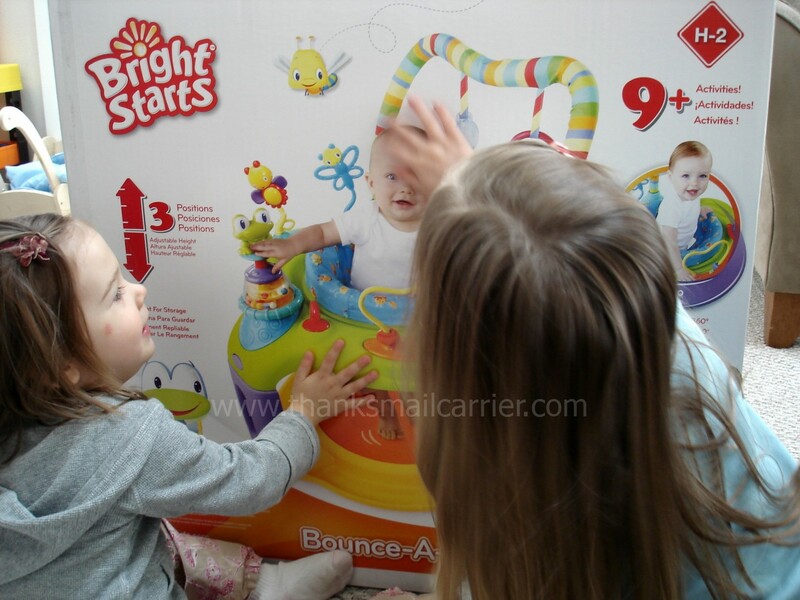 When the Bounce-a-Bout arrived, both of my girls were thrilled to see the brightly-colored box and cute baby pictured on the side. Opening things up, I laid out the pieces and was pleased to find that there wasn't too much involved for putting this together. 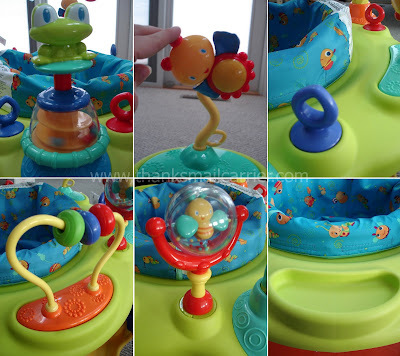 However, we still managed to easily snap each piece into place without trouble and all three of us were eager to check out the Bounce-a-Bout and all of its fun features. 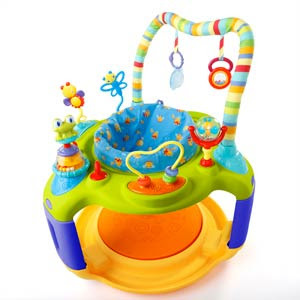 From the seven entertaining toys that are located within baby’s reach to the overhead toy bar that allows two to hang and encourage baby to reach and grab to the easy-to-clean toy tray that would be a perfect place for a quick snack, this is one entertainer that aims to please. 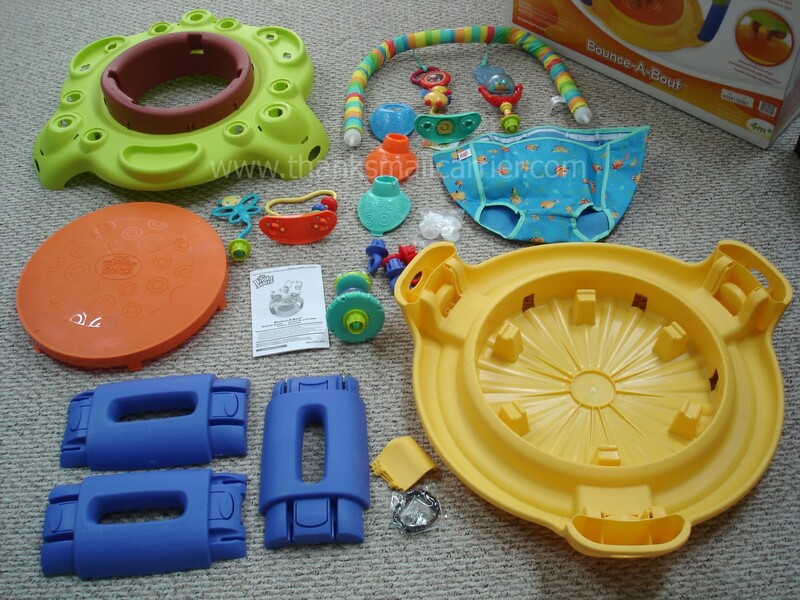 And even though Big Sister E and Little Sister B were mesmerized with things like the colorful bead chaser and push up spinner with swirling beads, I really appreciated all of the additional steps that Bright Starts included to make this gear really work for babies. The four toy loops spaced around the platform are great for attaching more toys, meaning that parents are able to customize and change what is available for their baby on any given day. Plus, with three height settings and a machine washable seat pad that can be adjusted smaller or larger, the Bounce-a-Bout really can grow with your baby without worry. 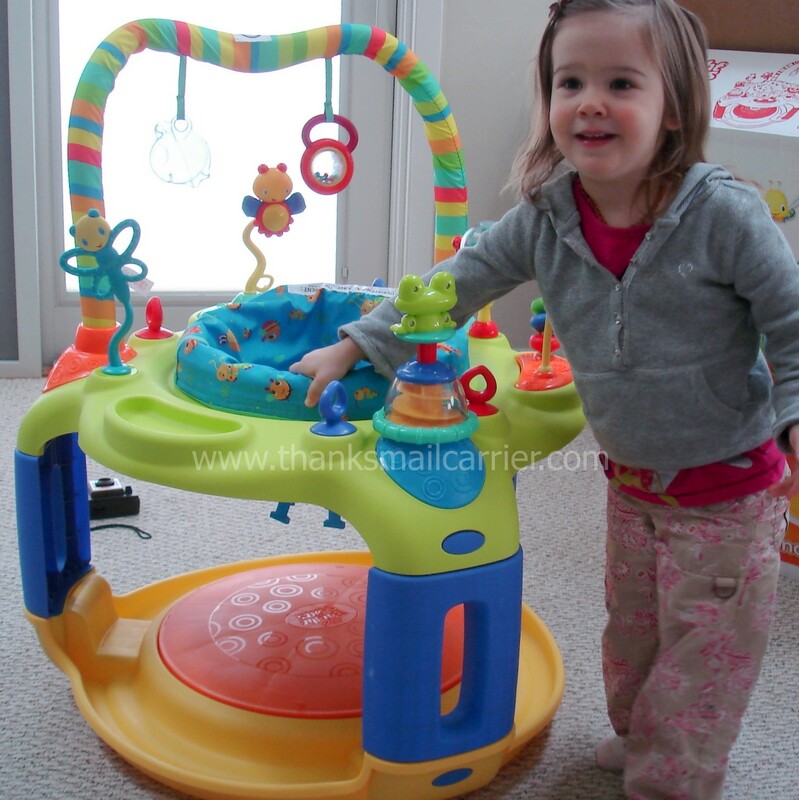 Not to mention the unique bounce pad underneath that provides a soft surface for bouncing and dancing and having fun! 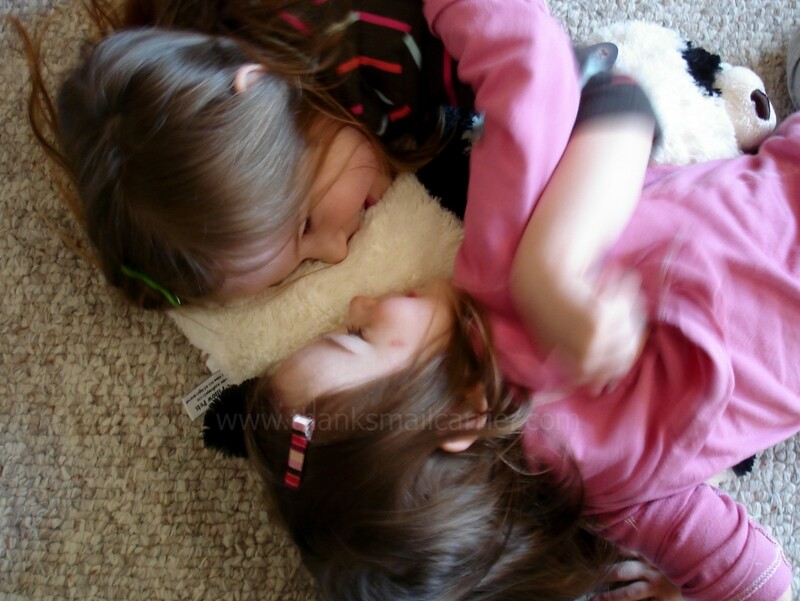 We have had a few young visitors to our home since the arrival of the Bounce-a-Bout and it has definitely been a hit. The seat rotates 360° so not only does the baby inside have access, but my daughters love "helping" with the bouncing, rocking, and spinning to ensure the most entertainment is being had. Every parent has been impressed with the high quality and details that went into this entertainer and the innovative way that it can be customized as well as grow with each child. As as added bonus, it even comes apart quickly and easily and lays flat for storage, which is great! In comparing it to previous entertainers that have been used, we all agree that this one is top notch! Designed for ages 4 months and up and for babies up to 30" tall, the Bright Starts Bounce-a-Bout retails for $59.99 and is available at retail locations such as Target, Toys 'R Us, and Walmart and can also be found on Amazon. For one baby gear purchase that will be sure to please and last for a good length of time, this is a great option! 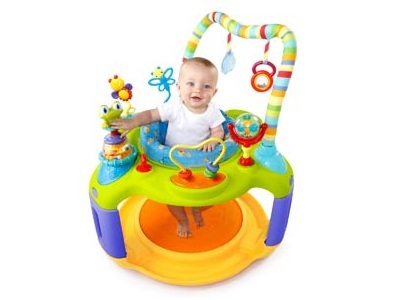 One lucky person will win a Bounce-a-Bout from Bright Starts! To enter to win: Visit Bright Starts and tell me another of their fun and innovative products that you would like to own. 1 Extra Entry (per method) if you follow Bright Starts on Twitter and/or Like them on Facebook. Giveaway will end on April 19th at 11:59pm CST. Do me the favor of leaving an email address or making absolutely sure it is visible in your profile, I have to have a way to contact the winner. The winner will be chosen by random.org and announced here as well as emailed and will have 48 hours to contact me or respond to notification or a new winner will be chosen. This giveaway is open to U.S. residents only. 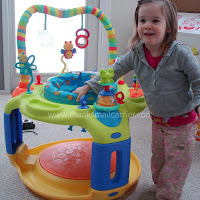 A big thank you to Bright Starts for providing a Bounce-a-Bout for me to review as well as for one lucky giveaway winner. The opinions shared are my own and honest and if you really need to see more, click here to see how I roll.